Bodega y Viñedos Adrada Ecológica, located in Adrada de Haza, a small village in Ribera del Duero, were set up in response to our dream of producing a small amount of high quality wines while protecting the natural environment. The quality of our wine comes from the way the vineyards are treated. We allow the laws of nature to rule the soil and crops. Kirios de Adrada is the first organic Ribera del Duero wine and it has the certificate of two denominations. The quality of the wine comes from the grape itself, the raw material of the wine. 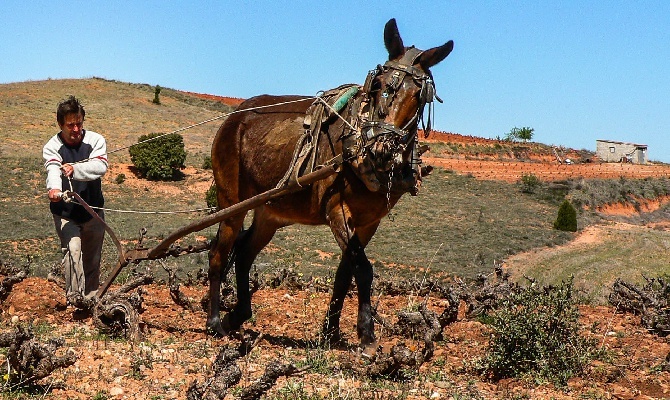 The treatment of the vineyards and our respect for the natural laws of life which govern the soils and the crops are essential if we are to achieve top quality grapes. Our main aim is to achieve top quality wine using biodynamic methods, wines that will delight our senses with a whole range of sensations. Ensuring that our wines are free of chemicals is essential. An intense, bright, lively wine. Deep red cherry in color with violet hues. Dense and tinted tears. Mild sensations of cocoa on an intense background of aromas of fruits of the forest (raspberries, blackberries and bilberries) and with a touch of licorice. Mineral aromas well integrated in toasted, fine and light sensations from its period in wood. A balsamic sensation which further balances the release of aromas from this charismatic, personal and complex wine. With regard to mouth feel there is strength and balance. It is pleasant, intense and full of flavor. Its entrance is enveloping, reaffirming in the mouth the slight cocoa flavors and powerful notes of fruits of the forest and licorice.